On Tuessday, Oct. 13, the Democratic National Committee will be holding its first presidential debate of the year in La Vegas. Given the importance their candidates seem to be giving the Latino voter, one wonders how they will be addressing this community’s most pressing issues. While the Republican Party has, courtesy largely of Donald Trump, already made an impact on its electorate through two high-profile presidential debates, the Democrats have not only been slow to start but are also mired in a major controversy about the debate process itself. Just as Trump’s shadow colors the Republican debates, so has the presumption of a Hillary Clinton coronation done with the Democrats. Only six debates were “sanctioned” by the Democratic National Committee in contrast to the 26 held back in 2008. Not only have the Democrats been slow getting out of the gate, but their debate process is mired in a controversy over whether the party has rigged it in favor of Clinton. 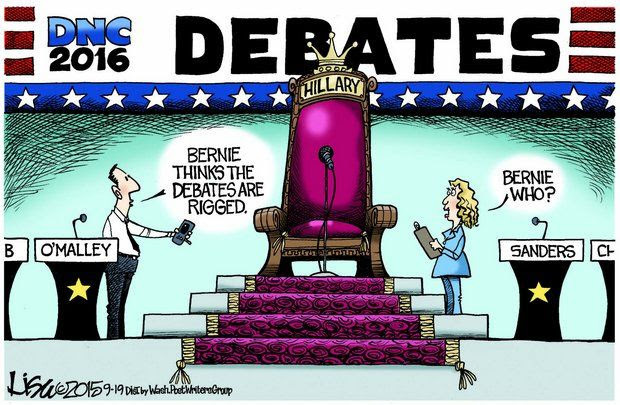 The question then becomes, Will the first Democratic Presidential Debate become more a debate about the debates than the issues? In other words, will the central question be the collusion of the party’s establishment with the Clinton campaign rather than the issues themselves? There are many indications that such a bias exists, such as the DNC chair having been co-chair of Clinton’s 2008 presidential campaign, along with the requirement of exclusivity to participate only in these sanctioned debates and no others, the timing of these few debates and so on. Will this be what the Democratic debate be mostly about? For the Latino community, one of the most obvious issues regarding these debates is the total absence of any Latino (as well as black) Democratic candidates for president. In their crowded field, the Republicans have two Latinos and a black man (and a white man married to a Mexican) running on politically regressive policies, but at least they can point to some diversity. The Democrats, who supposedly represent more liberal-to-left politics, need to explain why their candidates are so lily-white. At this more obvious level, there appears to be a serious disconnect the Democratic Party needs to explain and for which it needs to be held accountable. Why do the Democrats seem to reward Latino support by continually taking these voters for granted? But, let’s examine some of the issues facing the Latino community today. In a survey of Latino opinion leaders conducted by the National Institute for Latino Policy (NiLP) this past March, the most important problems they felt facing their community were the economy, jobs and income inequality. In whatever plans they propose for promoting greater economic growth for the country, how would they assure that this is done in ways that include the full diversity of the country’s population, especially the most economically vulnerable such as Latinos? Whether it is about stimulating small business development, curbing the inequities of the large corporations, reforming the tax code, or strengthening the social safety net, how will these plans directly impact or benefit those at the very bottom and who have been historically discriminated against? Will the candidates acknowledge the continuing institutional racism that exists in this country or simply revert to simplistic Horatio Alger storytelling? Immigration reform is another important issue facing the Latino community although certainly not the only one. Trump has certainly brought this issue into clear relief with his anti-Mexican rhetoric and its more subtle support by his party’s other presidential candidates. Will the Democrats commit themselves to make the passage of comprehensive immigration reform the top priority of their first term? President Obama made that a pledge back in 2008, which he broke. Will they now publicly commit not to break such a promise if they make it? On the other hand, do they believe that comprehensive immigration reform is still possible? Or should a more incremental approach be pursued? Will they, in the interim, maintain President Obama’s executive action curbing deportations? Would they support policies and legislation that will protect so-called “sanctuary cities” and promote more immigrant-friendly policies? Will we finally hear something of substance about U.S.-Latin American relations beyond Cuba as part of any discussion on foreign policy? It will also be interesting to see if the one Latino journalist from CNN en Español asking questions during the debate will be relegated to only asking about immigration. Related to the issue of immigration is that of mass incarceration and police-community relations. While the majority of Latinos are U.S. citizens and face the problem of racial-ethnic discrimination by the criminal justice system, this problem is exacerbated by the large number of undocumented whose legal status makes them even more vulnerable and subject to a dark immigration-incarceration complex and byzantine immigration regulations. While Latino advocates like to say that Latino issues are really American issues, it is still important to ask how these general issues will specifically impact on the Latino community. How will the candidates address the gaps in educational attainment? Will they address the need for serious gun control legislation that results in so many deaths in this country? Will the protection of the environment and arresting climate change be high priorities? Will they acknowledge that the location of their debate, Las Vegas, has a Spanish name (“the lowlands” in English) and reaffirm the value of the linguistic and racial-ethnic diversity to the successes of the United States? Another “American issue” that one wonders whether or not will come up in this debate is the massive debt crisis facing Puerto Rico today. Will the Democratic candidates have anything to say about the plight of the 3.5 million American citizens residing in that U.S. territory that, most agree, is a colony of this country? Will the Islanders’ plea (and those of the 5 million stateside Puerto Ricans) for support from the federal government be acknowledged by the debaters? Finally, there is the long-term issue of Latinos being the most underrepresented group in federal government employment. Although over 17 percent of the country’s population, Latinos remain at only 8 percent of the federal workforce and currently hold only two positions on the President’s Cabinet. Will any of the candidates address this issue of the lack of a significant Latino presence in the White House and federal bureaucracy despite representing one of the fastest-growing segments of the country’s population? Perhaps this may be expecting too much from the first Democratic Presidential Debate. Perhaps this is the least the Latino voter should expect from the party they have been so loyal to for so long. Angelo Falcón is a political scientist and President of the National Institute for Latino Policy (NiLP), based in New York City. He can be reached at afalcon@latinopolicy.org. The NiLP Report on Latino Policy & Politics is an online information service provided by the National Institute for Latino Policy. For further information, visit www.latinopolicy. orgSend comments to editor@latinoipolicy.org.
! Now I will have to publicly deny that the Republican Party paid us to misinform you! Talk about my being braindead on Indigenous People’s Day!!! The Puerto Rico Debt Crisis White House Petition Rewind!